It always bears repeating that when it comes to decorating for Christmas, Denis works on the outside, and I work on the inside. I do have to admit that I took the hedge clippers and other implements to the shrubbery out front so that Denis would be able to hang his lights, but I didn't lift a finger with the lights or anything else he did. Now...most of the outside decorating is strictly for evening enjoyment. (The new solar-powered Christmas lights are working beautifully, I might add.) I've always thought that the emphasis on darkness was a shame, so I invested in some daytime decorations for the front of the property, and Denis hauled out the ladder and put them up. Take a look and tell me what you think. Yes, those are Santa hats on some of the arms of our night-blooming senita cactus. I've seen folks on Facebook laugh because southern Arizonans put Christmas lights on cacti, so I had to post this photo on my Facebook page to show everyone that it's not just lights that we use as decorations. Someone asked how this could be done without the person doing it ending up covered in cactus spines. Yes, it does take manual dexterity, a good plan, and a bit of luck, but it also takes a tad of common sense: don't try this with a cactus that is covered with long, sharp spines. Denis did admit that a couple of the senita's arms didn't want to wear hats, and they bit him, but the bites were slight and forgotten about soon after they occurred (because the spines are few and very small). 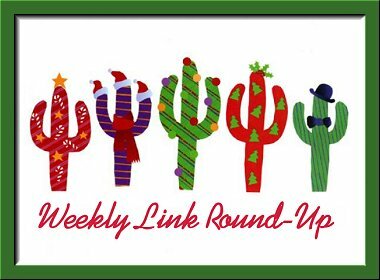 Now that he's done, I'll mosey out to the link corral and enjoy his handiwork. Head 'em up! Mooooooove 'em out! Someone with a sense of humor is adding fake subtitles to library books. How World War II created the CARE package. How the internet killed the world's most important punctuation mark. Square dancing is uniquely American. What archaeologists and historians are finding out about the heroine of a beloved young adult novel (Island of the Blue Dolphins). Goodreads is revamping its giveaways program. The State of the Cozy (Mystery). Christmas at the Smithsonian's dolls' house includes all the trimmings-- in miniature. The un-Christmassy origin of gingerbread houses. Ancient human skeletons are revealing that the plague arrived in Europe during the Stone Age. Behold the newly digitized 400-year-old Codex Quetzalecatz. "Completely unique" Iron Age party cauldrons and more have been unearthed in Leicestershire, England. Archaeologists sent an ancient Egyptian mummy through an imaging scanner, and here's what they saw. How the discovery of Julius Caesar's first landing point in Britain could change history. Mexico establishes the largest marine protected area in North America. Super pictures capture this year's only visible Supermoon. Our cloud names come from Luke Howard, an 18th-century amateur meteorologist. Wilson A. Bentley, the man who revealed the hidden structure of falling snowflakes. Eleven books to read if you want to understand caste in India. Children's book characters we wish were friends. Twelve literary cocktails to pair with classic reads. Eighteen times libraries had the best holiday displays ever. The best book covers of 2017. Decorating tips for shelves and bookcases. Twelve desserts inspired by classic Christmas books. It's really not got anything to do with ingenuity-- as can be seen in the next comment. 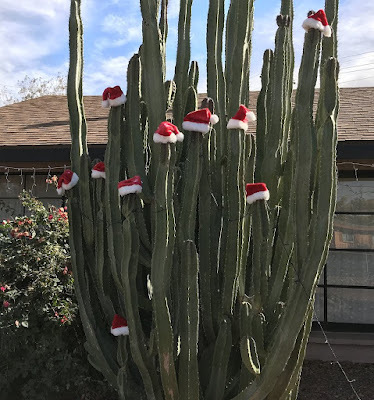 I haven't seen it done too much here in the Phoenix area, but I did see a photo on Pinterest, and I knew I had just the cactus to put hats on! 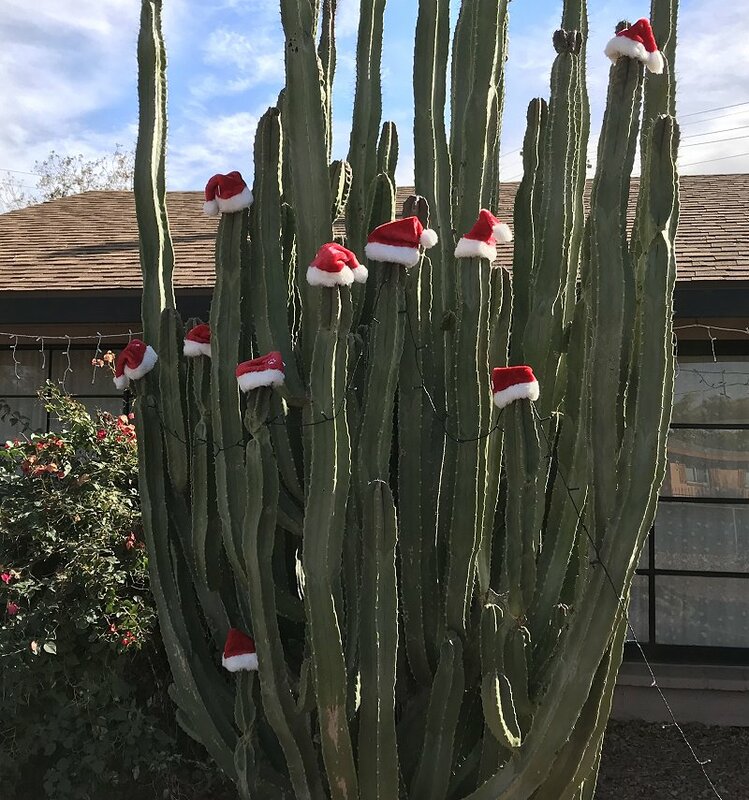 In Tucson we (and many others) always put Santa hats on the top of cacti in the winter in order to protect the more fragile tips from frost. ♥ Love ♥ your hat wearing cactus!! !